Esmerelda Spider is no ordinary Witch. She’s a Witch on a mission. She’s casting a spell to spread wonder and awe to the world. Watch how she brings her magical crystal ball to life, seemingly floating in the air like a bubble and making it roll effortlessly around her hands and body, like it has a mind of it’s own. She will hypnotise you with her magic, leaving everyone she meets in a enchanted haze….will you believe your own eyes? 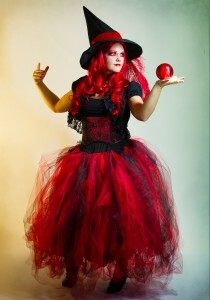 This spellbinding walkabout act is perfect for Halloween and magical themed events. Bringing the rare and skilful art of contact juggling to a wider audience, this act will be a memorable and unique addition to any event.